Tracy Rides in the Parade! Since 1991The Rancho Bernardo Business Association has elected an Honorary Mayor of Rancho Bernardo from among its members. The candidates each year are selected from the members of the association who have also contributed to the local community beyond their business activities. This last year Tracey Van Putten was selected as a candidate for her community involvement that included being a key leader in the successful fundraising event of the Rotary Club of Rancho Bernardo, Rancho Beernardo Festival. Tracey van Putten, who at the time was working at Skyline Home Loans, . In a spirited competition with the candidate from Greenway Lawn Aeration, Alex Lawn. Tracey ran an excellent campaign that ultimately came up short. The ultimate winner was the RBBA because both candidate worked hard in this fundraising competition. 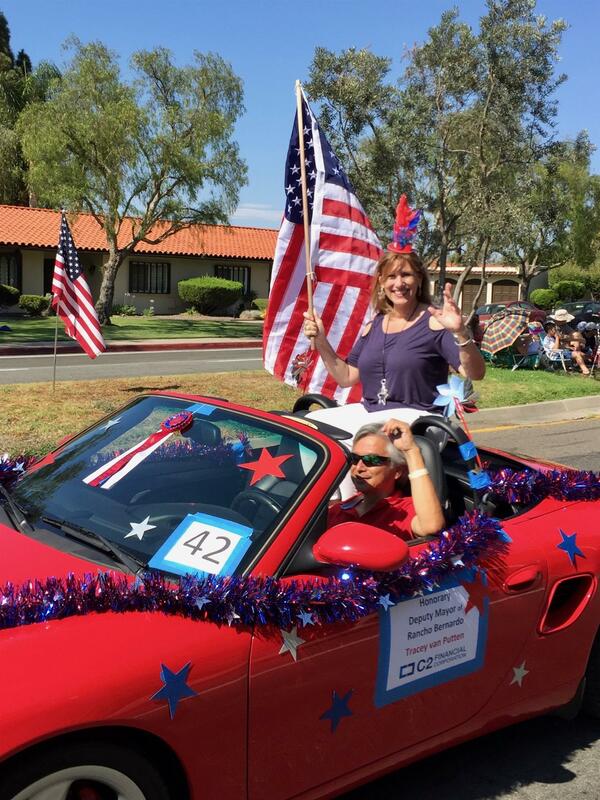 In recognition for her efforts in supporting the RBBA, Tracey is the current Deputy Honorary Mayor of Rancho Bernardo. In the photo above you can see that Tracey had a great time riding in the parade. Rancho Bernardo Sunrise Rotary is proud to have such a dynamic civic-minded person as a member.